I’d like to create effectively a mail merging form creating a two page A4 pdf form the details entered. Though would need the option for users to add additional addresses and names. Ie add another customer, then a row with extra name, address, post code, etc is shown, this then extends the document and merges the additional information. And is it possible to also capture the day being entered? PRO2PDF is not capable of ‘randomly’ spanning data across pages or ‘automatically’ spawning new pages. All PDF forms must include preset/pre-sized fields. 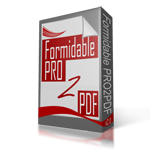 That said, we have assisted many users in creating multiple PDF forms for the same Formidable form and dynamically selecting which PDF form to use based on Formidable form data such as the number of entries in a repeatable section or conditionally completed fields. However, our future version of PRO2PDF will span data and spawn new pages. Named E2Pdf and now accepting beta tester requests, E2Pdf is currently in Alpha testing with a beta version expected in March. 3) Add a hidden field to the Formidable form with [date] as the default value.